Once we leave Uyuni, the road winds up through multiple hairpin bends. We ride away from the salt flats and ride into the mountains. 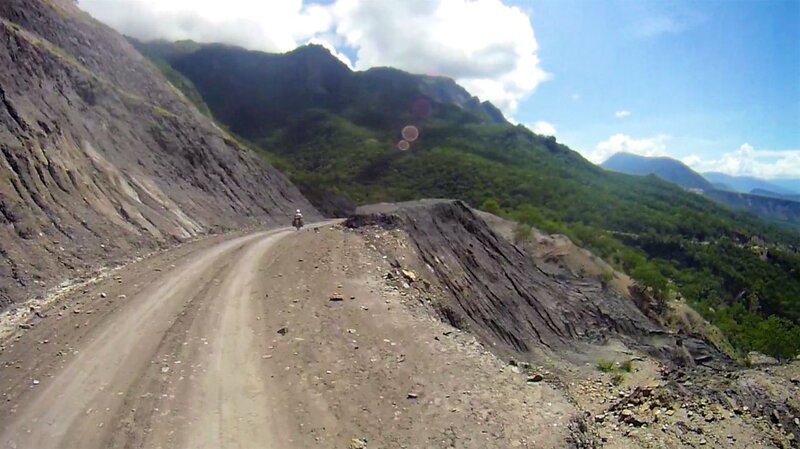 A new asphalt road brings us in no time in Potosi, our destination for the day, where we arrive around lunchtime. The town lies at the foot of the ’Cerro de Potosi’, which is also called ’the rich mountain’ because of the silver that is found here. The Spaniards were the first who took out the silver on a large scale. 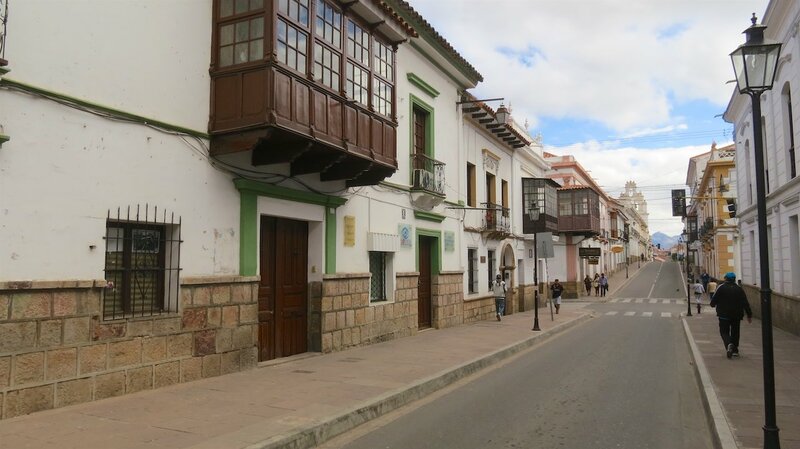 Potosi grew into an important trading town, with beautiful cathedrals and big mansions that were built during the colonial era. Now, several hundred years later, the mine is still in use. Although the city has lost some of its luster and glory, it is still very vibrant. We park the bikes at a hostel in the center of town and use the rest of the day to wander through the maze of streets in the historical center. The next morning we ride northeast. We are immediately back in the countryside. No major colonial buildings, but simple houses of clay with a corrugated roof. Often without electricity or running water. The difference between the wealthier middle class in the city and the poverty in these towns is very big. Every piece of land is used as farmland. The hills look like patchwork, with lots of small fields with different crops. Along the road are bags full of onions, potatoes and pumpkins ready to be brought to market. And bags of quinoa. The seeds have only been popular in the Western world for a few years, but in South America quinoa has been on the menu for centuries. Like yesterday the road is in good condition and before we know it we are at our next destination Sucre. 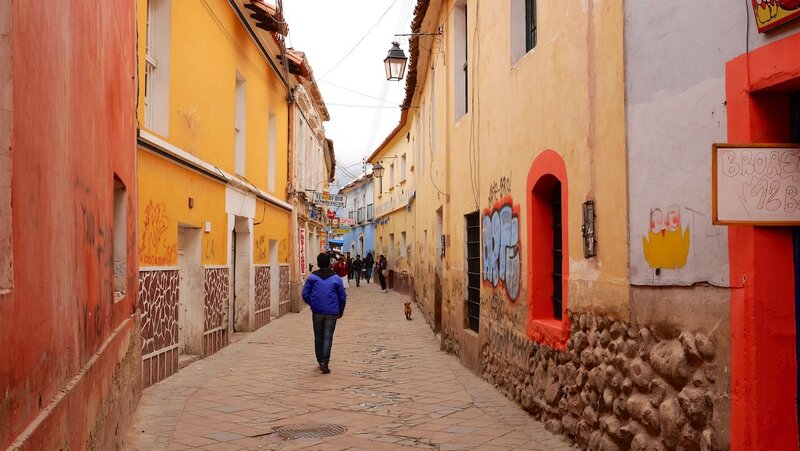 A beautiful old town in central Bolivia. 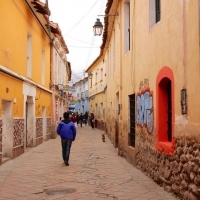 It is the best preserved colonial city in South America and is even on the World Heritage List. We plan to stay here for a while. To visit the beautiful city, but that’s not the main reason. We will go to school here, because it is time to learn some Spanish! When we travel, we always learn a few words of the local language. The contact with the locals is very different if you can greet them or thank them in their own language. In Africa, those few words of Arabic or Swahili were enough. We could always get around with English and French. And if that did not work, we could always use our hands and feet for sign language. That changed when we arrived in Argentina. The few words of Spanish we knew were clearly not enough, and almost no one seemed to speak English. In addition the proud Argentines did not seem to (want to) understand our sign language. In Chile, we got a little further with English, but as soon as we left the touristy places we were again faced with the language barrier. It had only one advantage that nobody spoke English, because it is without a doubt the fastest way to learn a foreign language. Thanks to a talent for languages ​​and the fact that I speak French, I quickly started to understand more Spanish. And using a dictionary and some language apps, we both learned more and more words. We did develop an odd vocabulary though. We could tell all sorts of technical details about the motorbikes in Spanish, but struggled to order food in a restaurant. It was very frustrating at times, up to the point that our first weeks in South America were not the most fun ones. To change this, there is no other solution: we have to go to school to learn Spanish. An investment from which we will benefit up to Mexico. We were advised to take classes in Bolivia. 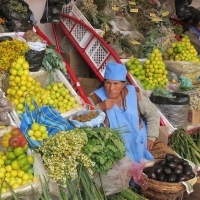 Not only because the lessons are affordable, but mainly because the Bolivian Spanish is very easy to understand. Much better than, say, the Argentine Spanish, which also has many Italian influences. And if we are to stay in one place for a while, we might as well stay in a nice place. 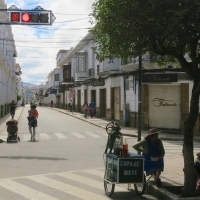 Sucre seemed the ideal city, with a large number of language schools, a beautiful scenery and a nice climate. 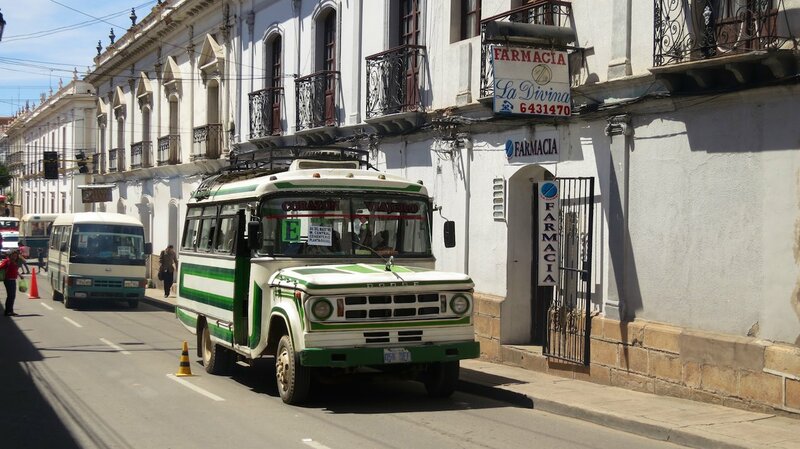 In Sucre we find a nice room at Hostel Pachamama. We immediately start looking for a language school. The next morning we are at the desk of Elizabeth, the owner of Language School Me Gusta. In an interview she tests our Spanish. After a second test for reading and writing she knows exactly what we need. We are put into two different groups and sign up for one week of four hours of Spanish every day. The next morning we arrive at the school at 08:30 am with a fresh notebook and lots of energy. Peter will have private lessons until other students sign up. I am put in a group with a friendly guy from Scotland, with Carolina as our teacher. She immediately gets started. We conjugate verbs, read aloud from Spanish texts and make sentences with newly learned words. Carolina does not speak English, which forces us to really only use Spanish. During the coffee break I meet up with Peter. He has also been put to work. The coffee tastes good and gives some energy for the second part of the lesson. After four hours the bell rings, the end of our first day. And that was just in time. Our heads cannot take any more Spanish and our hand needs some rest after the frantic writing. Excited about the newly learned Spanish, but also tired and hungry, we go in search of some lunch. In the central market lunch is served on the first floor. They have set up long picnic tables where you can sit down to eat the daily special. At the head of each table is a woman in an apron and a white cap, who is calling out what the daily special is. On the other side of the table are huge pots from which another lady, also in an apron and a cap, fills up the plates. Without understanding what we can eat here, we choose one of the tables. Mostly because the lady behind the pots had smiled so friendly at us and her customers had moved to give us a seat. We point to the plate of our neighbour and raise two fingers. She has understood. 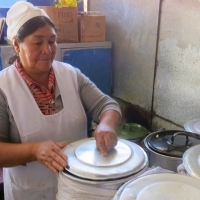 From one of the big pots she fills two plates with soup. It tastes delicious! 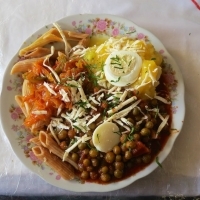 The soup turns out to be the appetizer, because she then asks what we would like to eat as ’secundo’. as our main course. 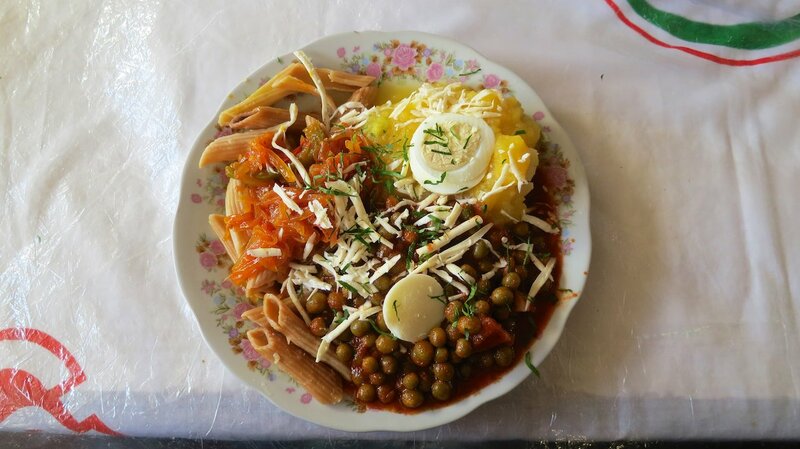 We point to the plate of our neighbour again and each get a plate with pasta, potatoes, beans, some chicken and a sauce. This also tastes really good! We were hungry when we arrived at the market, but now we feel like we cannot eat any more for the next few days. When we ask for the bill, we have to pay 24 Bolivianos, just over $3,50. Unbelievable! Tired but happy we walk back to the hostel, where we carefully take a look at our homework. It is a lot! The rest of the afternoon we sit silently on our bed while we sweat over the exercises. Even after all these years, homework still is not our favourite way to spend the afternoon, but it’s for a good cause. It is a bit easier though than in high school, especially when we think of how much we paid for the lessons. It is still very early when we go to bed that night, but we are very tired. And tomorrow another day full of Spanish awaits us! In the week that follows, we have a fixed daily routine for the first time in a long time. Every morning the alarm sounds at the same early hour and after a quick breakfast we walk with our backpacks to school. For four hours we learn new verbs and read more Spanish texts. The theory is mixed with lots of time to practice our Spanish. Not only in class, but also when we go to the market or a museum with our teachers. After each lesson we trudge to the market to have lunch. The first lunch was such a success that we sit down at the same table every next day. Doña Maria’s table, we soon learn. Each time we come back she is very happy to see us and asks her customers to move a bit to make some room for us. 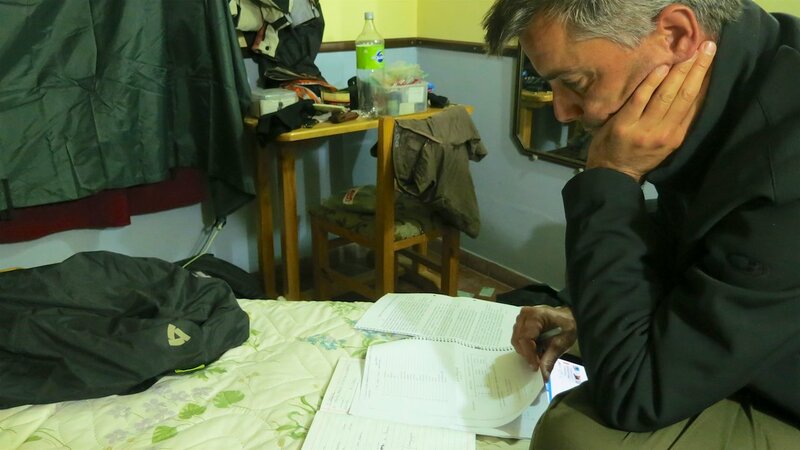 Back at the hostel we then use the afternoon and the evening to do homework. And then again to bed early because the next day starts early as well. The days go by very fast and before we know it we have finished our week of classes. Just as quickly as the days pass, so fast did our Spanish improve. Almost without noticing, we can now understand more and more people. The questions of Carolina, the conversations at the table of Doña Maria and the chatter on the street. It’s like someone flipped on a switch which turned the ambiguous sounds into something we can suddenly understand. I cannot get enough of it, and find myself eavesdropping on conversations everywhere. And in addition, we can now also make ourselves understood. We practice our newly learned Spanish everywhere. First, a bit reluctantly, but soon we try to use beautiful full sentences. And it works: they understand us! And it gets even better, because when they answer in their rapid Spanish, we can now understand that as well! It is magical and feels almost liberating after the difficult start in South America! It’s so nice that we decide to take another week of Spanish lessons. But before we start our second week of classes, we first enjoy our weekend. And after the first week in a long time with a fixed daily routine, this actually is our first real weekend in a long time. Sleeping in on a Saturday was never so nice. We put away our textbooks and make some time for other ’work’. Peter takes out his tools to work on his bike. He opens the engine for a job that looks like open heart surgery to me. He’s busy all day, but at the end of the day he stands beside his bike smiling to hear his engine sounds very smooth again. Job well done! Peter is not the only one who is working on his bike. 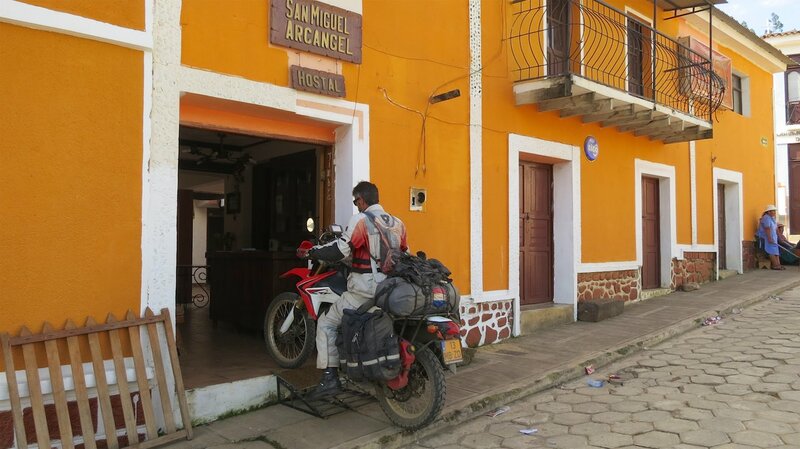 There are six other motorcycle travellers in the hostel, who all do some maintenance. 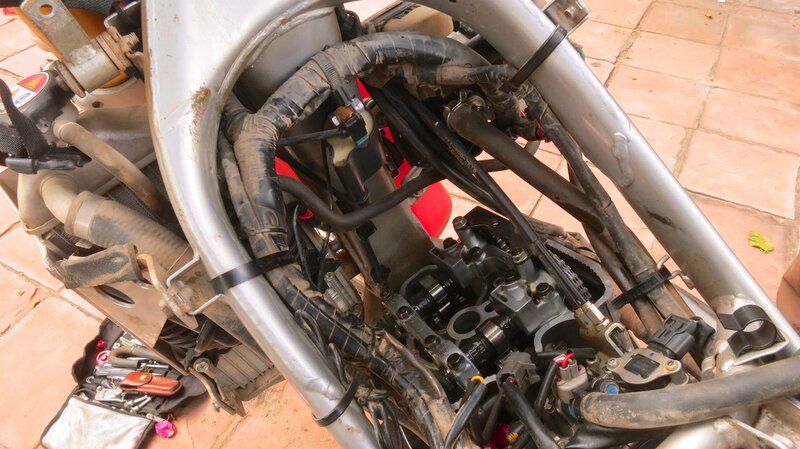 Oil is replaced and chains are tightened. When the work is done, we sit together to exchange some bike talk and good stories, while sharing some beers. On Sunday, when all bikes are running again, we go for a ride with Jose and Gitana, an Italian-Australian brother and sister from Melbourne. With four bikes in a row, we ride a lovely winding road to Tarabuco. The town is famous for its Sunday market, where people come from the surrounding villages to sell their goods and do shopping for the next week. Many of the people are dressed in traditional clothes. Especially the women look beautiful. They wear a pleated skirt and bowler hat with two long braids underneath it. They wear their groceries in a woven cloth on their back or as a bundle on their heads. Although the market is visited by many tourists, it is clear that the locals are not dressed up especially for the tourists. 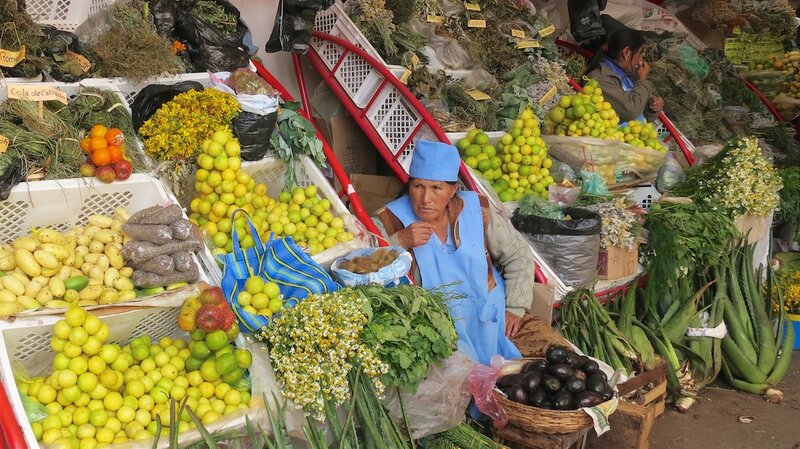 Everywhere in Bolivia we see that people are holding on to their traditions and are dressed in traditional clothing. 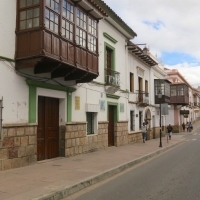 In the countryside, but also in cities such as Potosi and Sucre. The next morning we go back to school for our second week of Spanish. Peter now has some classmates and follows the lessons I had last week. I am in Carolina’s class again who teaches me the past tense of verbs. Just like last week there is a lot of time to practice our Spanish. Which is great, because this is what is most useful when we are back on the road. It is also nice because it basically means that I chat a lot with Carolina. She tells me about her family and everyday life in Bolivia and I tell her about my family, our journey and our lives in the Netherlands. The whole week we eat lunch at Doña Marias. By now we do not have to point to the plate of our neighbours any longer, but we can simply tell her what we would like to eat. Every day after lunch we walk around on the market, a favourite part of the day. 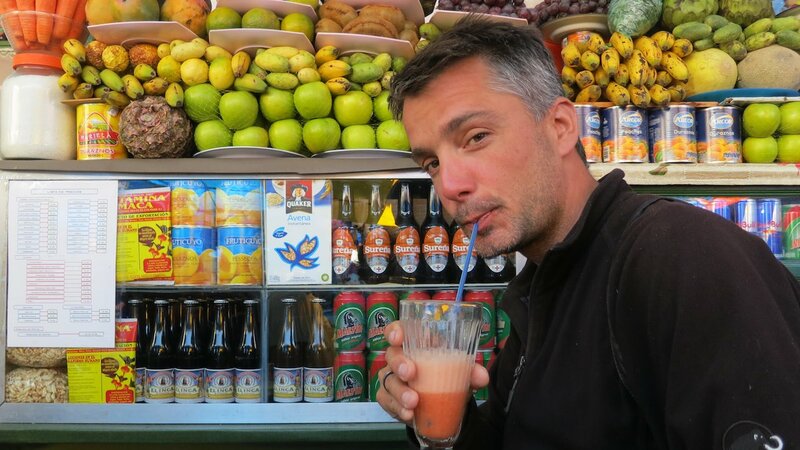 We buy some fruit juice or do some shopping for dinner. And if we do not need to buy anything, I will make up something to buy with the excuse that we have to practice our Spanish. At the market you can buy almost anything. In one corner we walk past stalls full of fruit and tables full of bananas. A little further they sell vegetables, and behind it are a dozen stalls with fresh cheese and eggs. For the potatoes we have to go to the corner of the fresh herbs. We can choose from 20 different types of potatoes, from small purple ones to chunky yellow ones. We have to buy the fresh bread, because it smells so good. The only stalls we quickly pass are the meat and chicken stalls. Contrary to what we are used to, the meat is not kept cool, but is just out in the open, exposed on the counter. We doubt our stomachs would be up for that. Moreover, they also sell pieces of “meat” that we would not want to eat, like the nose or the brains of a cow. And if you look carefully, it appears that many more strange things are sold in the market. In the small, dark stalls in the back llama foetuses and beaks of all sorts of tropical birds are hanging from the ceiling. Witchcraft, according to my teacher Carolina, who explains that the people believe it brings luck if you bury a llama foetus under your house. The second week at school passes just as fast as the first. On Friday, we thank our teachers for all they have taught us and are excited to celebrate another well-deserved weekend. 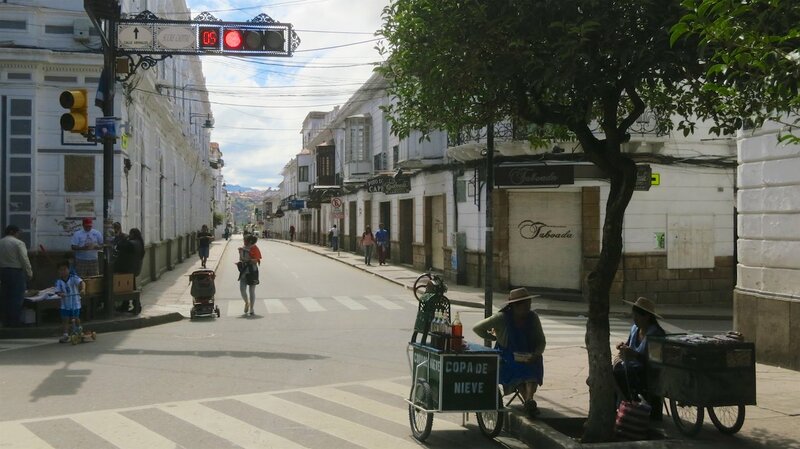 Although we have spent two weeks in Sucre, we have not seen much of the city at all, apart from the market. We use the weekend to walk around and visit the place we have been ’living’. Sucre is a beautiful city. Especially the tall white buildings are impressive. They give the city its the nickname ‘La Ciudad Blanca’, the White City. We stroll through the old town and take the bus to a higher square where we have a beautiful view over the city. 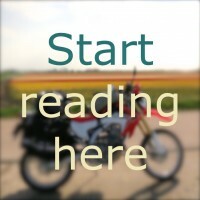 After a few days, in which Peter finished the last jobs on the bike and I finish another story for the blog, something starts to itch. It’s time to ride again. On the map we draw the route we want to take. First through the mountains to the east and then through the jungle in the north with a detour to La Paz. Thanks to the friendly customs officer who gave us 60 days when we entered, we have plenty of time to ride the entire route. 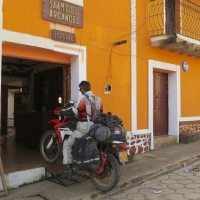 We do some shopping in Sucre, say goodbye to our motorcycling friends and hit the road again. The first day we follow a main road east, until we arrive in Villa Serrano at the end of the day. 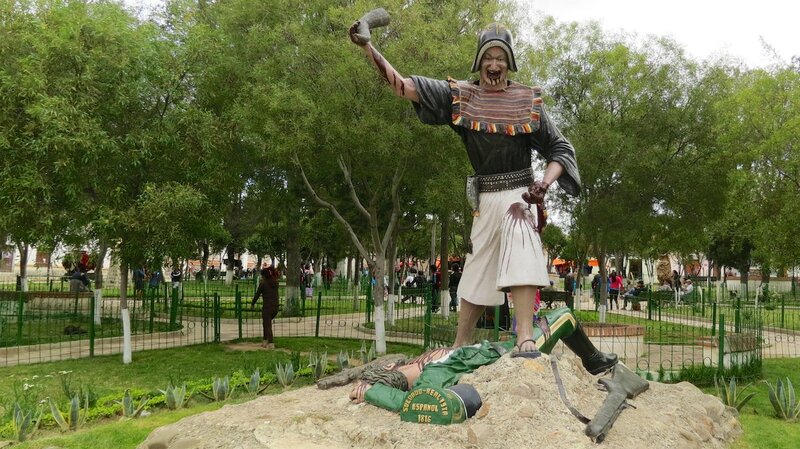 It is a small village, which, like all other hamlets in South America is built around a central square. Experience learns that most hotels can also be found on that main square. And that also is the case in this village. We find a room at a small hostel. They do not have safe parking for the motorbikes, but we can park the bikes inside in the courtyard. To get there we need to ride the bikes through the main entrance passed the front desk. Fun to see every time it happens. Villa Serrano is a small village, but it has accomplished a world-class performance which was mentioned in the Guinness Book of Records. 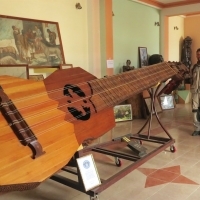 Villa Serrano is home to the world’s largest ‘charango‘. A charango is a small guitar of about 60 cm which can be found in South America, especially in the Andes. The characteristic sound of the charango can be heard in many typical South American music. In honor of a famous charango player the village built a huge charango of more than six meters which has to be played by ten people at the same time. 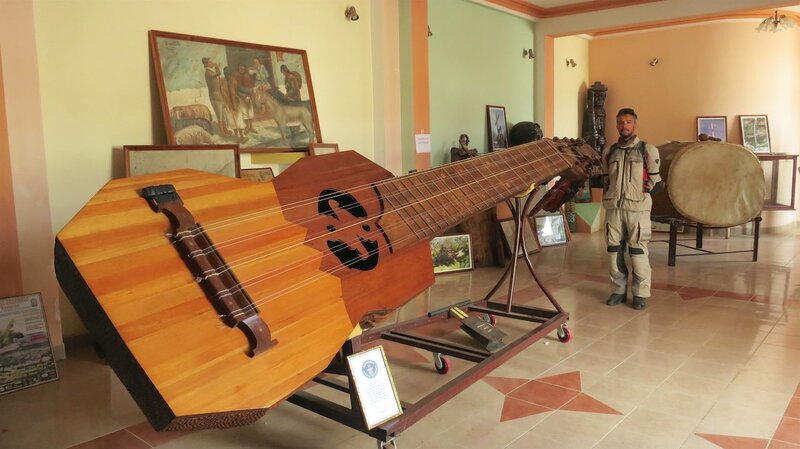 The giant charango can be seen in a museum at the town hall. We get a tour around the museum by a friendly lady who proudly shows us the certificate of the world record. 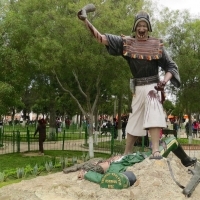 From the giant charango in Villa Serrano we ride further north. 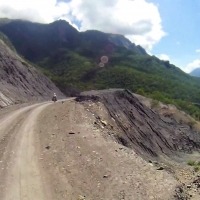 We follow a beautiful gravel road through the Bolivian countryside. A beautiful route, where we hardly see any other traffic. The road winds through the hills, past fields and through little villages. As we drive past, people stop working to look at us with their mouths wide open. When we stop it often happens that people walk up to us and just stare at us for a while. It is a strange feeling that we attract so much attention. Having already experienced this in Africa, it is getting a bit easier to respond to this. Instead of opening the throttle en racing through the villages, we usually slow down and just open up our helmets, to then friendly smile and wave. And when we stop, we say hi to everyone around us. Usually the expression on their faces then changes into a friendly smile. Their hands go up to wave at us and sometimes they even come to us for a chat. Now we are back on the road, we immediately notice what a huge difference it makes that we have learned Spanish. 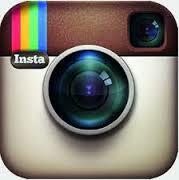 We can understand almost everything and can have a chat with everyone. Well almost everybody, because a large part of the population in the Bolivian countryside only speaks Quechua. But even then a friendly “buenos dias” on our part, is answered with a friendly greeting from their side. 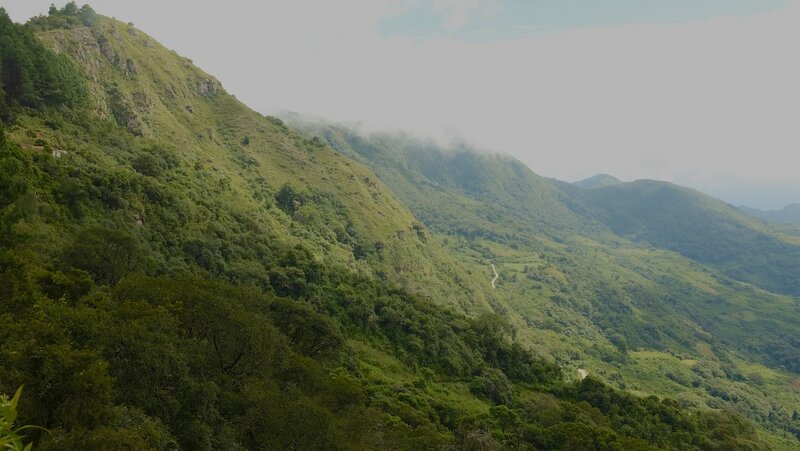 The route through the mountains is beautiful, with steep hills to our left and a lovely view of the valley on our right. It is green and everything is in full bloom. The road follows the river for a long time. In places where the water flows down to the river in the valley during the rainy season, the road has been badly damaged. There are deep grooves and gullies in the road in places where had been a lot of mud and in some other parts the road is even completely washed away. We are happy that it is not raining today, even if it means we ride in the dust. 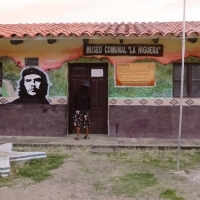 Part of the route we ride is known as the “Ruta del Che”, the ‘Che’ Guevara trail. 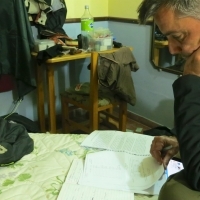 The Argentine-Cuban guerrilla activist stayed in Bolivia in the late 60s to help the Bolivian people with their revolution against the regime. 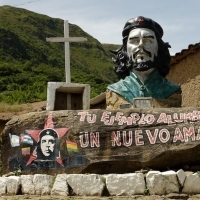 After being betrayed by one of the Bolivian fighters, Guevara was captured by the Bolivian army near the village of La Higuera. He was taken to a school in the village where he was executed shortly after his capture. 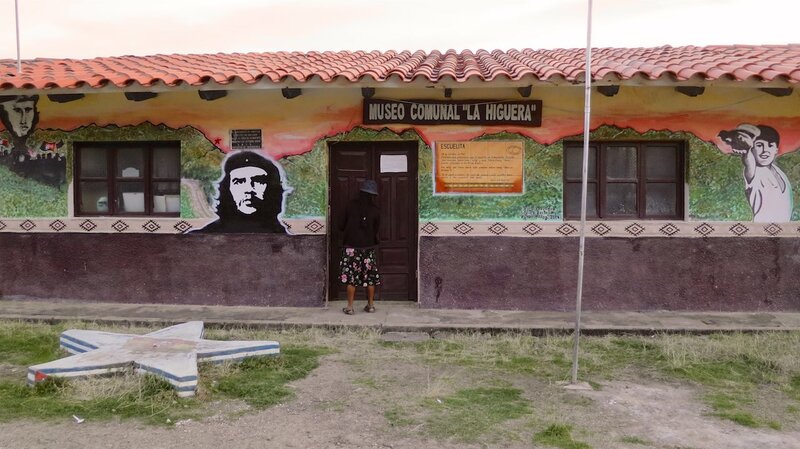 The “Ruta del Che” follows the tracks of Che, with a small museum in the former school as the main attraction. 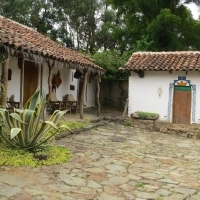 We arrive in La Higuera at the end of the afternoon and find a camping spot at “La Casa del Telegrafista”, the house where the telegrapher once lived. Today the house is home to a small hostel with a nice camping area in the garden. The next morning we walk around in the village and visit the museum. A friendly little lady opens the door for us. On the walls are boards with information about the life of ‘Che’. Apart from those boards, the small room is filled top to bottom with pictures, newspaper articles and notes that were left here by visitors. La Higuera has become a pilgrimage. People from around the world and from Argentina in particular come here to commemorate Che. All of the buildings feature beautiful murals and famous quotes. On the central square there are several large sculptures, including a bust that was created based on the famous photograph of Guevara. 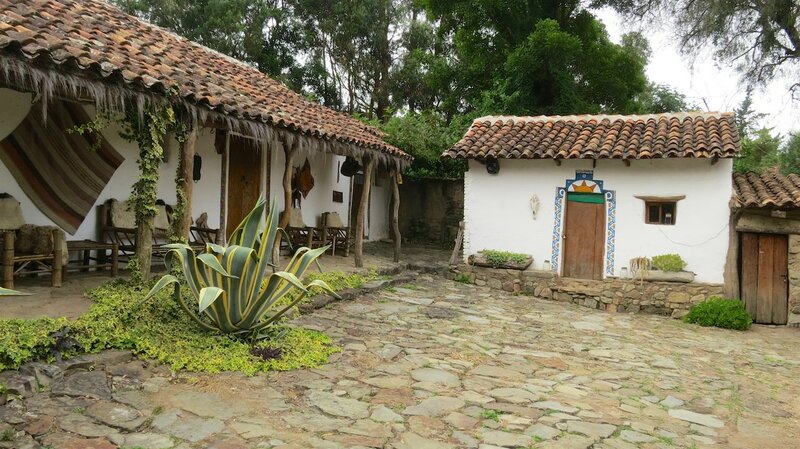 The ideas of Che and the famous bust were not the main reason for us to visit La Higuera. Besides revolutionary and guerrilla fighter, he was also a motorcycle adventurer. 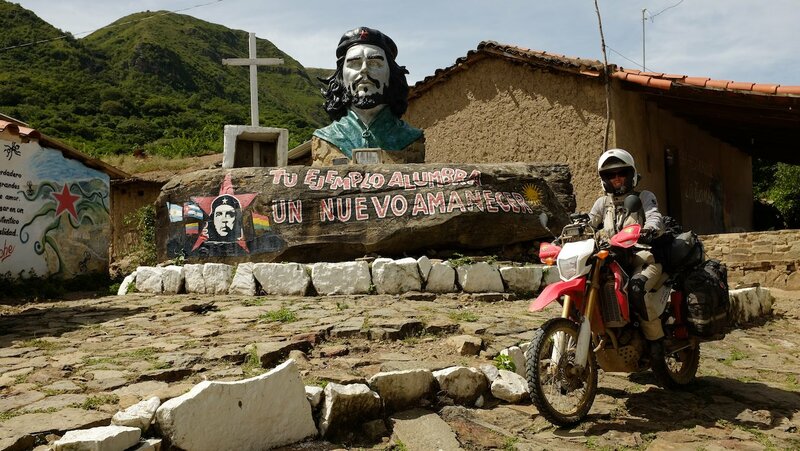 Long before he arrived in Cuba, when he was still Ernesto Guevara, he left on an epic motorcycle adventure through South America with his friend Alberto. 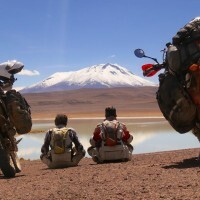 They left from Buenos Aires in Argentina on a Norton 500 CC for a journey through Chile, Peru, Colombia and Venezuela. The journey would take them a year. Guevara kept a diary which was published as a book, and was the basis for a great movie called “The Motorcycle Diaries”. 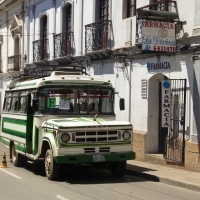 An inspiring story for anyone who plans to travel through South America. For us seeing the movie was enough reason to ride to La Higuera. From the small village, we ride further north through the mountains. A scenic route with magnificent views. That night we end up in Samaipata, a touristy town on the busy main road to the east. When we wake up the next morning the sky is grey. It rains and according to the weather forecast it will keep raining all day. We decide to wait and hope that the clouds will have passed tomorrow. The next day the sky is clear, so we continue east. We leave the mountains and ride slowly toward the lowlands. 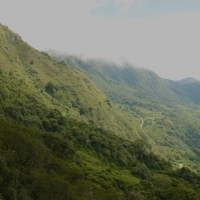 With every hundred meters we descend, the landscape and the vegetation changes. For the first time since Africa we see banana plants and tall palm trees. It is also swelteringly hot, very different from the fresh wind that blew in the mountains. And that’s not the only change. When we arrive in Santa Cruz that evening we feel like we have just ridden into another universe. 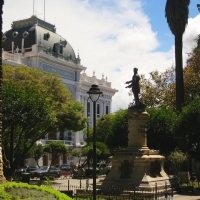 Santa Cruz is one of the largest cities in Bolivia, a hub on the way to and from Brazil. 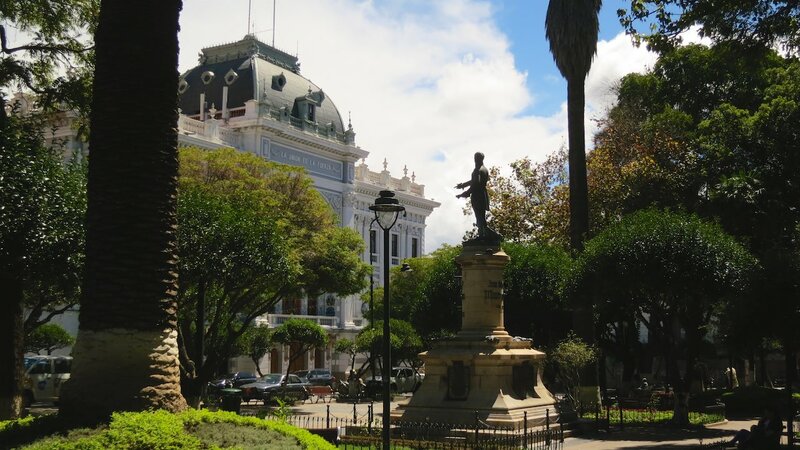 It has an old historical center, but also a major business district with high-rise buildings. It is a slight culture shock after the small mountain villages we rode through the last days. And even in the supermarket we cannot believe our eyes, because we can really buy anything we can think of. For the first time in South America we find peanut butter! We check in at a hostel and stay for two days. Not because it’s such great fun city, but mostly to prepare for the next part of our trip through Bolivia. From here we go to the Bolivian jungle! We would like to thank everyone for reading our stories. Even if it sometimes takes a little longer before a new story is posted on the website. We are also very happy with the all the great messages we receive on the website, by email and on Facebook! It is really nice to hear you reading our stories and ’travelling with us’! Subscribe for the email service and automatically receive a notification for each new post! Zo ik ben weer bij met het lezen van jullie geweldige verslagen over jullie wereldreis! ( druk, druk, aardbevingschade herstellen! ja, het hoge noorden hè ?). Ik heb weer genoten van jullie prachtige verhalen, en de schitterende foto’s!! Heel veel succes en plezier, en natuurlijk veilige! kilometers. Wat een lekker verhaal weer om te lezen, en op die manier Spaans leren gaat natuurlijk als een speer. Ook dit verslag is weer prachtig! En wat goed dat jullie echt hebben zitten studeren, superknap! 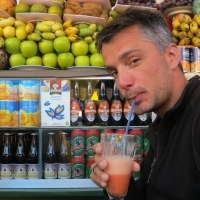 Being able to communicate with the locals certainly enhances the travel experience and opens up the world (which is why I usually stick to English speaking countries). I am happy you took it upon yourselves to learn Spanish more completely. You seemed to already know some Spanish when we met at Shakana’s, as you helped me with translation. 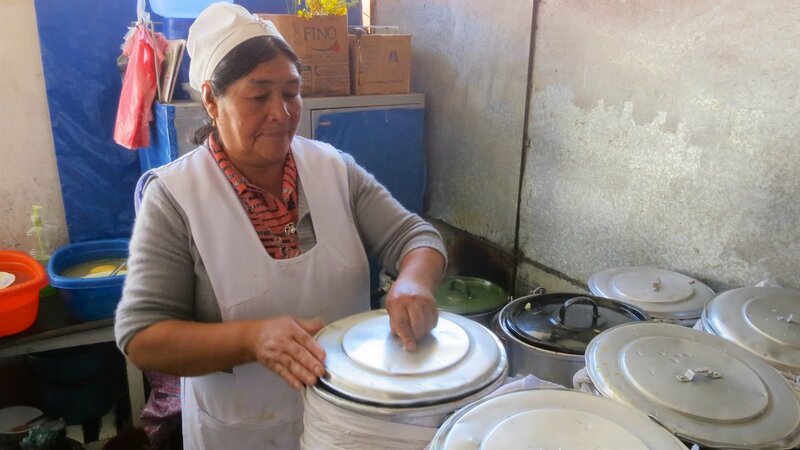 In the southern part of Patagonia, it was relatively easy to get by without knowing Spanish because of the international atmosphere, but the further north I went, the more difficult it became when there were no other gringos to help. I hope you manage to make it thru Asia with relative ease, with all those different languages to wade thru. You are the most adventuresome people I have ever had the pleasure to meet and that memory will live on. Ciao. Na lang wachten weer een nieuw verslag van jullie reis. Hier in het (voor jullie) verre noorden wordt de verslaglegging van jullie reis op de voet gevolgd. Regelmatig is dit in de meetkamer regelmatig onderwerp van gesprek. We hopen dat jullie nog vele mooie kilometers mogen maken, en ons daarvan laten mee genieten. Conducir con cuidado y mantener los motores y de vosotros, por supuesto, de verdad. Als mijn vertaalmachine het goed heeft gedaan, en jullie je huiswerk hebben gedaan, zouden jullie dit moeten begrijpen. Kiek oet en du veurzichteg. Stelletje knapperds, gewoon Spaans leren spreken in twee weken! Mooi verhaal en prachtige plaatjes weer. Sucre, dat ga ik onthouden, heel mooi! Hallo jullie daar zo ver weg. Leuk om weer wat te lezen hoe het met jullie gaat. Het blijft leuk om met jullie mee te reizen. Ga vooral zo door. Nog veel plezier en we lezen graag met jullie mee. Dit verhaal was het wachten zeker weer waard! Prachtig, zoals de avonturen worden beleefd en beschreven, ‘k geniet er iedere keer weer van. Veel succes en plezier verder met jullie tocht!